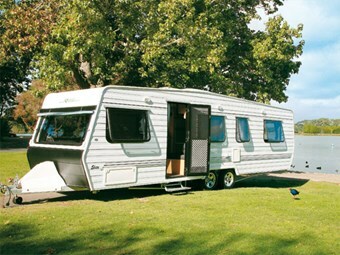 The base of the Elite caravan is built on a hot dipped galvanised chassis with 100mm x 50mm (4in x 2in) rails. 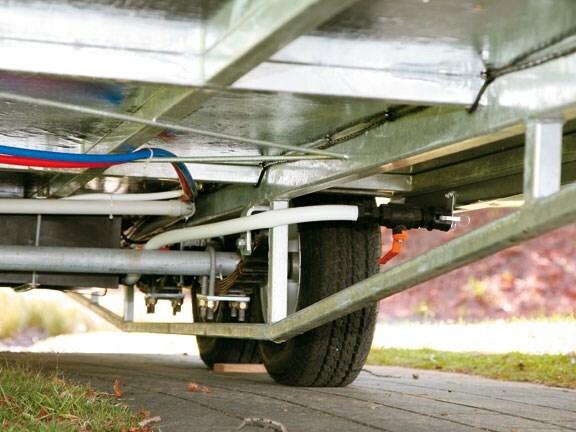 Eye-to-eye leaf-spring suspension is used on the tandem axles and the fresh water tank is fitted between the axles for both mechanical protection and keeping the water weight central. Most of the Elite is covered by a moulded shroud but the ball coupling, handbrake, safety chains and jockey wheel are all readily accessible. At the rear a full width bar provides both bump damage protection and a mounting point for the spare wheel. The van body is built with a timber frame and has aluminium cladding, and the roof is a one-piece item to minimise leaks. The floor is ply timber and that and the roof and walls are insulated. The windows have a double glazing arrangement. A stone protector, which can be rolled up if not needed, is fitted to the front window of the van. With a tare weight of 1850kg and an ATM of 2050kg, the Elite is in large sedan or mid-size tow vehicle territory. 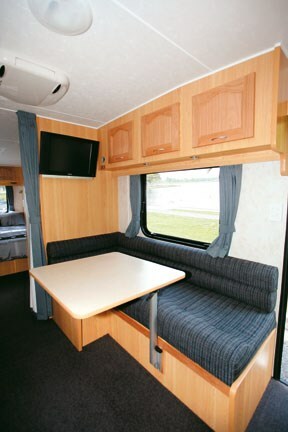 The layout of the Elite features a front club-style lounge, a kitchen bench that runs along the offside and an L-shaped lounge with a dining table fitted opposite. Dividing the rear bedroom off from the living area of the van is a bathroom and a large wardrobe. The kitchen bench is built in an L-shape. Built into the kitchen are a four-burner hob/grill/oven alongside a stainless steel sink and drainer. 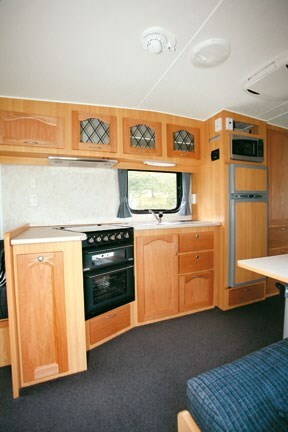 The fridge, a 141-litre three-way Thetford with a Sharp microwave above, sits alongside the kitchen bench. Opposite the kitchen is the dining area, complete with a swivelling table. Mounted on the bathroom wall is a 19in flat-screen TV, which can be seen from both the dining and front lounges. ‘Compact’ describes the bathroom, but it does have a variable-height flexible-hose shower, Thetford cassette toilet, corner wash basin, shaving cabinet and both a roof vent and frosted glass window for ventilation. A heated towel rail is fitted outside on the bedroom wall of the bathroom. Opposite the bathroom is a large wardrobe with plenty of hanging space, two large drawers and a floor locker. Taking up most of the space in the rear of the Elite is the queen-size bed. Windows on three sides give plenty of light and ventilation. To read in-depth motorhome and caravan reviews, see the latest issue of on sale now at all good retailers. 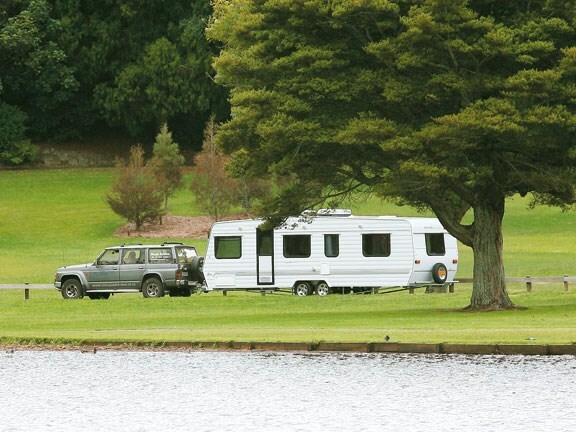 Or subscribe to Motorhomes, Caravans and Destinations magazine here. 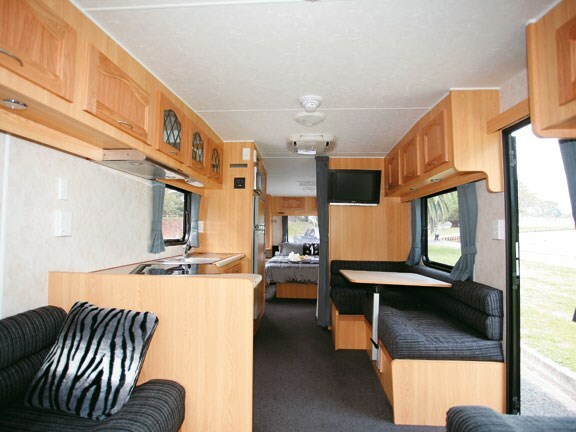 See Leisure Lite caravans for sale here.